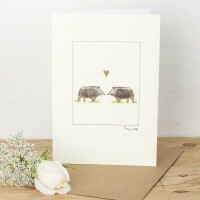 From time to time we have a bit of a shake-up - some designs go in for a re-design, others get discontinued. So check back from time to time - you never know what you might find here. 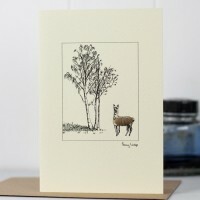 Alpaca & Tree Card This is our beautiful alpaca & tree card. A woolly alpaca stands by a .. 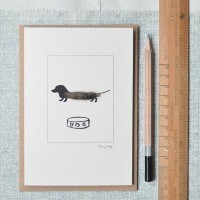 This is our original dachshund card design - at the time we thought we'd just do this one dog card -.. 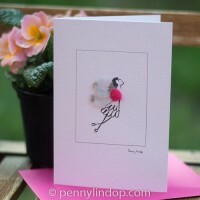 Handmade Greeting Card - Bright Pink Fluffy Fairy A beautiful handmade greeti..
A cute little fairy smelling the flowers, hand finished with a mauve fluffy body and glittery silver..
Boars & Heart Card Our boars & heart card is not supposed to bore you! 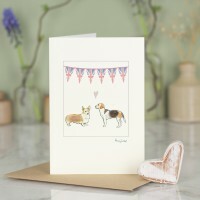 We hope these 2 wi..
Our Royal Wedding dogs card was created to celebrate the wedding of Prince Harry and Meghan Mark..